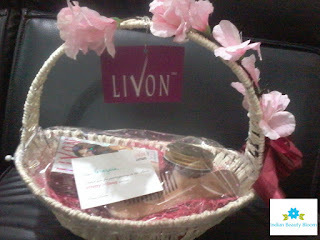 Recently I got a Gift Hamper from Livon , the hamper is in form of a beautiful basket with a Livon serum , a wooden comb & a candle , everything is good , the thing I liked most is the basket . That made me realise that product packaging and gifting makes a difference . Livon is not a new product in market , its available since long , I have used it before also . Again I am using it now. Its a good product which helps to control Frizz , ease out tangles and reduces hair breakage . Its a light colourless serum which has a nice fragrance . Product packaging is good , its available in a plastic bottle from which serum can be easily squeezed out . It can be used either on shampooed hair or dry hair . One can apply small quantity of it on damp hair or even dry hair , it eases the tangles and thus there is less hair fall while combing the hair . 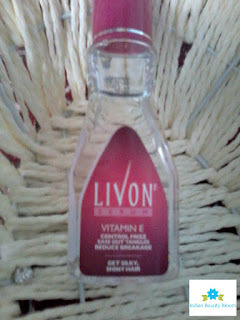 It should not be applied on Scalp but should be applied hair specially the at the bottom of hair length. Regular usage helps to get Silky and Shiny Hair . 1. Has a nice fragrance which stays for long . 2.Helps to Detangle hair . 3.Reduces breakage while combing . 5.Does not makes the hair look or feel oily . 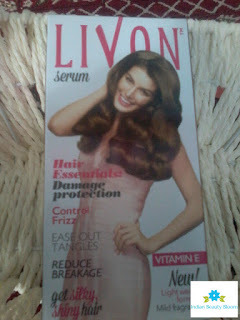 6.Its a light hair serum which is easy to apply . Price may seem bit high but its ok as its an excellent product. Because of pollution and harsh climate some times it is difficult to maintain our hair , hair becomes dry , rough and looks life less , so such hair Serums do really helps to restore and maintain shine and health of hair , helps to keep it healthy and silky . It moisturises the hair and forms a protective coating which protects the hair from dust , harsh sun rays etc. This serum can also be used to style our hair .It gives bouncy and shiny effect to hair with in few minutes and one can do hairstyle of their choice . Those who have not used it should give a try once .